According to IPCC, the industry sector accounts for about a quarter of the world’s total anthropogenic greenhouse gas (GHG) emissions (after allocating electricity-related emission to end use sectors). This is by far greater than GHG emissions from the Building and Transportation sector, yet these two sectors often get more attention than the industry sector. Unlike building and transportation sector, the manufacturing sector is more complex which involves tens of industry subsectors that are vastly different from each other with regards to the production technologies and systems they use. It looks like this complexity drives many people and organizations away from the industry sector. However, without seriously tackling the energy use and GHG emissions in the industry sector, we will absolutely fail to meet the goals of Paris Climate Agreement. In terms of GHG emissions, these three manufacturing subsectors, i.e. iron and steel industry, chemical and petrochemical industry, and cement industry account for even larger share, over 65% of total industry sector GHG emissions. This is because of high levels of non-energy related GHG emissions (or process emissions) from these three subsectors particularly the cement industry. Worldwide, around 63% of total GHG emissions from the cement industry is process-related emissions (from chemical reaction during calcination process), which are not included in the Figure 2 below. What makes the matter worse is the high share of fossil fuels, especially coal used in the industry sector. Coal accounts for over 75% of the final energy used in the steel industry worldwide with another 10% of energy coming from natural gas and oil (IEA 2017a). In the cement industry worldwide, coal account for over 60% final energy use and natural gas and oil account for another 15% of total energy use (IEA 2018). The other point to keep in mind is that with world’s population increasing from 7.6 billion in 2018 to around 10 billion people in 2050 with majority of population increase to happen in developing economies, the absolute demand for cement, steel, and chemicals is expected to increase significantly by 2050. While many people are hoping that we will clean the electricity grid and then electrify almost everything, thereby addressing the climate change issue, this is far more complex in manufacturing sector compared with the building and transportation sector. First, as mentioned above, industry sector with many subsectors which are quite different technologically will need many different types of electrification technologies. 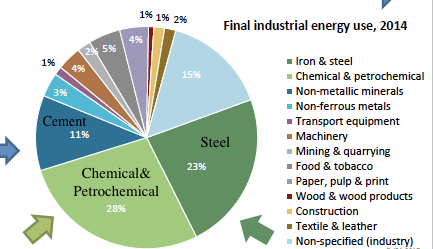 Second, around 74% of the final energy used in industry sector is fuel from which almost 48% is used for high temperature heat (above 400 Degrees Celsius) most of which is used in the steel and cement industry among others (Figure 3). Electrifying this high temperature heat demand has proved to be difficult in these 3 industry subsectors. In summary, without decarbonizing the iron and steel, chemical and petrochemical, and cement industry, it is impossible to reach the Paris Climate Agreement’s goals and peak the total GHG emissions early enough to keep the temperature rise below 2 degrees Celsius. Therefore, we need more focused attention by public and private sectors as well as NGOs and philanthropists to gather and allocate resources to reduce GHG emissions in these 3 industry subsectors. The time is running out with regards to climate change mitigation timeline and peaking world’s GHG emissions. We need to focus on areas where we can get huge savings and gigaton scale GHG emissions reduction. If we don’t, scientists have given us some clear dire warnings! See the list of some of our related publications for the iron and steel, cement, and chemical industry from this link. IEA/WBCSD. 2018. Technology Roadmap-Low-Carbon Transition in the Cement Industry. IEA. 2017a. Global Iron & Steel Technology Roadmap. IEA. 2017b. Renewable Energy for Industry. IPCC. 2014: Summary for Policymakers. In: Climate Change 2014: Mitigation of Climate Change.